Acclaimed British actor best known for his role as Batman. 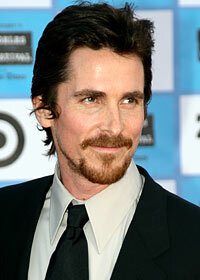 He's other famous films include Steven Spielberg's Empire of the Sun, American Psycho and The Prestige. Jim Graham:"Learned a new word today. Atom bomb. It was like a white light in the sky. Like God taking a photograph." Jim Graham:"Hey! How ya doing Frank?" Dainty:"Hey kid, would you like a Hershey bar?" Jim Graham:"Oh yes please Dainty!" Dainty:"So would I kid. Have you got one?" Jim Graham:"Hello Nina. Would you like a Hershey bar?" Jim Graham:"So would I kid. You got one?" Jim Graham:"Wow! Ha ha! Go! P-51! Cadillac of the sky!" Jim Graham:"Mrs. Victor, why did the Japanese close the school?" Mrs. Victor:"Because they wanted to punish the grownups." Jim Graham:"I can't remember what my parents look like." Jim Graham:"I touched them! I touched them! I felt their heat! I can taste it them in my mouth! Oil and cordite!" John Connor:"If we stay the course, we are dead! We are all dead!" John Connor:"We've been fighting a long time and we have all lost so very much, so many loved ones gone. But you are not alone. There are pockets of resistance all around the planet. We are at the brink." John Connor:"There is no fate, but what we make." John Connor:"You and me, we've been at war since before either of us even existed. You tried killing my mother, Sarah Connor. You killed my father, Kyle Reese. You will not kill me." John Connor:"This is John Connor. If you're listening to this, you are the resistance." John Connor:"There is a storm on the horizon. A time of hardship and pain. This battle has been won, but the war against the machines rages on. Skynet's global network remains strong, but we will not quit, until all of it is destroyed. This is John Connor. There is no fate, but what we make." Alfred Borden:"Are you watching closely?" Alfred Borden:"The secret impresses no one. The trick you use it for... is everything." Alfred Borden:"Who wants to volunteer?"